When I arrived at Bull Hole this morning the loomery was extremely sparse, illustrated by the photo on the left. By 4pm however, the number of birds was higher than I had seen all week, with many new ledges occupied and familiar ones heaving with birds. As well as guillemot returning to claimed ledges I noticed groups in flight approaching the colony in sync but landing in different areas, usually being chased off only to regroup and try again. 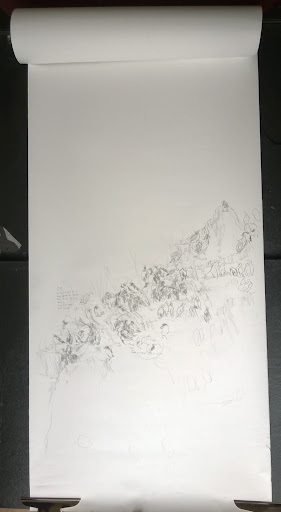 I began a third scroll around this time, of a section stage left of the second scroll that incorporates research groups B and C. Again I used the faster method of line drawing to capture most of group C before 6pm. This third Scroll, makes up a triptych of vertically hanging scrolls partly inspired by groups of hanging scrolls made in the Chinese tradition (e.g Wang Jian 1598-1677) but necessitated by the formation of steep cascading colony ledges at Bull Hole. Developing the drawings has been a learning curve first to establish what is achievable in this environment, secondly to work as economically as possible and thirdly to practice patient observation so that reacting to capture every movement and posture becomes more and more intuitive. The drawings I made towards the end of this week are minimal almost diagrammatic in the way they describe the essence of each individual behaviour. 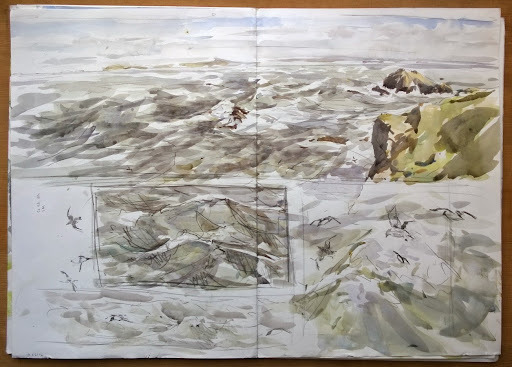 However the view they present is an insight of the colony on an individual, pair or small group level of detail restricted by the speed I can draw one to a few birds. 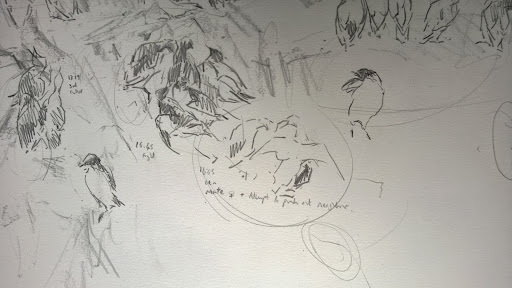 Next time I visit Skomer in a few days, I will be looking at how to describe mass or synchronised behaviour over much larger groups or the entire loomery, using rapid marks or symbols that can be later deciphered into a recognisable drawing - visual ethograms. 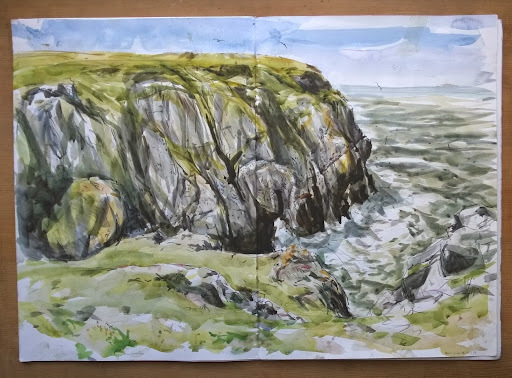 Weather permitting I hope to carry this work out at the Amos, so I can aim for a series of drawings covering a range of study sites used by Tim and at the same time follow the progress of G907.